Drew Cloud was a prolific writer specializing in student loan issues, founder of the Student Loan Report, and “a source for news on the student loan industry, financial aid, and scholarships.” Media relied on him for sensational surveys about student debt issues and quoted him often. 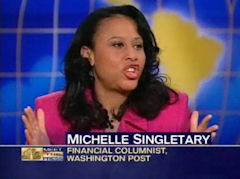 In a February 20 column which lamented as a tragedy the mess that former Rep. Jesse Jackson (D-Ill.) got himself into by improperly using campaign resources for extravagant personal expenses, Washington Post personal finance columnist Michelle Singletary scolded her readers to "think about the mess you might have made of your finances or the financial follies of people you know" before "pass[ing] judgment on the Jacksons." In a column in which she never mentioned Jackson's party affiliation, Singletary suggested that the Illinois Democrat procured luxury items including a $43,350-gold-plated Rolex watch because he and his wife Sandi were "eager to impress their more wealthy colleagues or the people who run with them in their circle of power and privilege," but she added that it was "[n]ot an excuse, just an observation." Leftist media critics resent that newspapers have a "Business" section or that PBS used to show "Wall Street Week," as if reporting on business automatically means you're pro-business. The Washington Post on Sunday seemed to be working overtime to publish an Anti-Business section, with two columns endorsing the "Occupy Wall Street" protests, an enormous article by liberal Post wunderkind Ezra Klein on how the Obama "stimulus" was too tiny, and a whole page devoted to the Bloomberg expose of the Koch brothers' shenanigans in Iran. Steven Pearlstein wrote a column on how "Obama can learn from Wall St. protest." Michelle Singletary's column was titled "Rage, rage against Wall St." and compared the protesters to Rosa Parks fighting racism on the bus. From windy Washington, D.C., to sunny Palm Beach, Florida, the liberal print media are refusing to note the liberal bent of an interest group vocal in the health care debate. The March 26 edition of the Palm Beach Post -- a broadsheet notorious to conservatives for its unbalanced treatment of Rush Limbaugh -- featured not one but two articles which pushed government-run universal health care. In both of them, the Post asserted that Floridians are dying daily due to a lack of health care coverage.